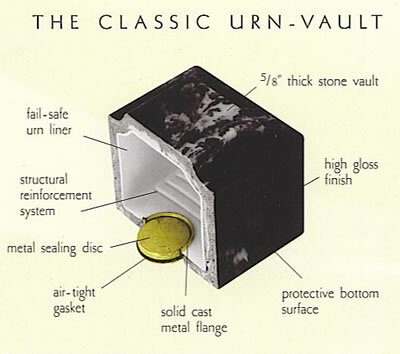 The USAF Cultured Marble Urn Vault is crafted from cultured stone, a mixture of crushed stone, designer resin, and blue color pigments imitating a deep blue marble. Veining patterns and coloring will vary with each urn, just as with natural stone. A color embossed US Air Force Emblem is on the front of the urn, allowing room on the top of the urn for personalized engraving.